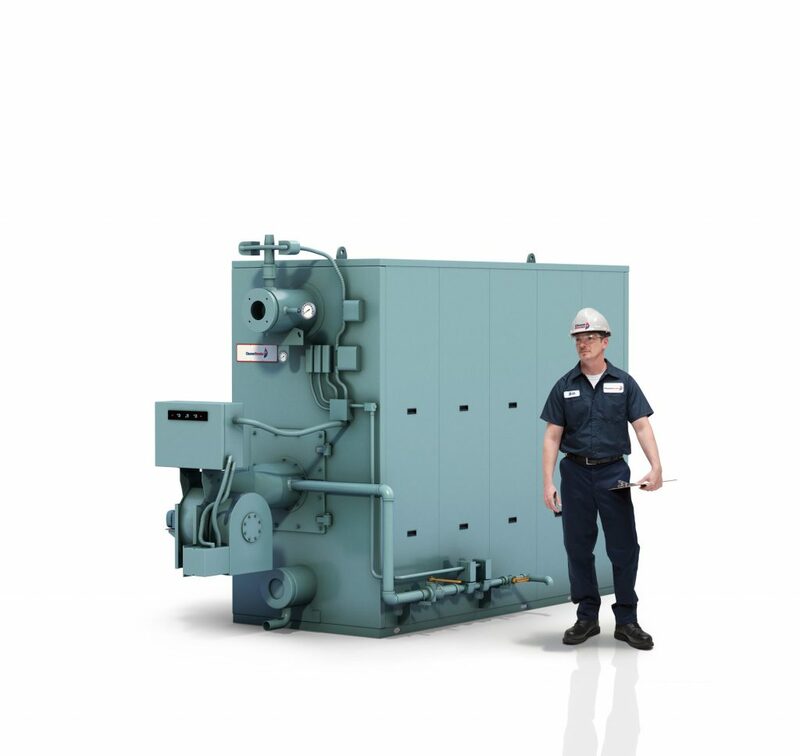 As the founder of the packaged boiler, Cleaver-Brooks knows all about the power of integration. Today, the rules still apply. 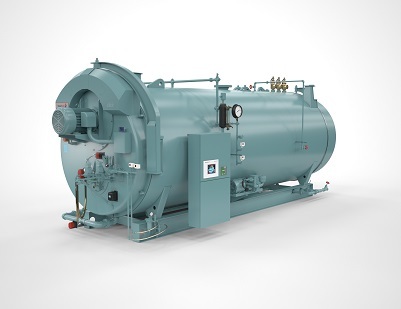 Cleaver-Brooks engineers the firetube boiler along with the burner, controls and ancillary components as an integrated package to achieve maximum efficiency and the lowest possible emissions. The EX models are designed with extended heat transfer tubes that result in even higher efficiencies, lower emissions and a 15% smaller footprint. The CBEX Elite model is the only boiler package to maintain 3% oxygen across the full operating range with 30 ppm NOx performance when using natural gas. For reliable response for low/high pressure process steam/heating loads, multiple fuel firing capability. Applications include indirect heating and process for various campus operations, medical facilities, manufacturing operations and pharmaceuticals. 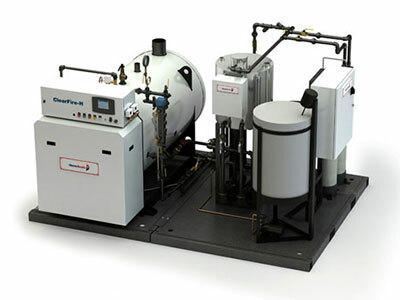 The ClearFire-V (vertical design) and ClearFire-H (horizontal design) steam boilers are quiet and compact. The design of the extended surface AluFerⓇ tube provides maximum heat transfer resulting in greater efficiency and low NOx technology. Save on fuel with full burner modulation, high turndown with variable speed motor. Operation is reliable and maintenance is simple with no dampers or linkages. For comfort heat and process applications for schools, commercial buildings, apartments and decentralized facilities. Parker boilers require less than 10 minutes to heat up to 100 psi from a cold start, which saves time and fuel usage. The staggered tube design allows free expansion and contraction. This simple design of individual tube sections that each connect to the boiler drum and lower headers, enables easy inspection and maintenance. The atmospheric low-pressure gas burner provides high combustion efficiency and uniform heat distribution while the automatic burner controls provide electronic flame supervision. 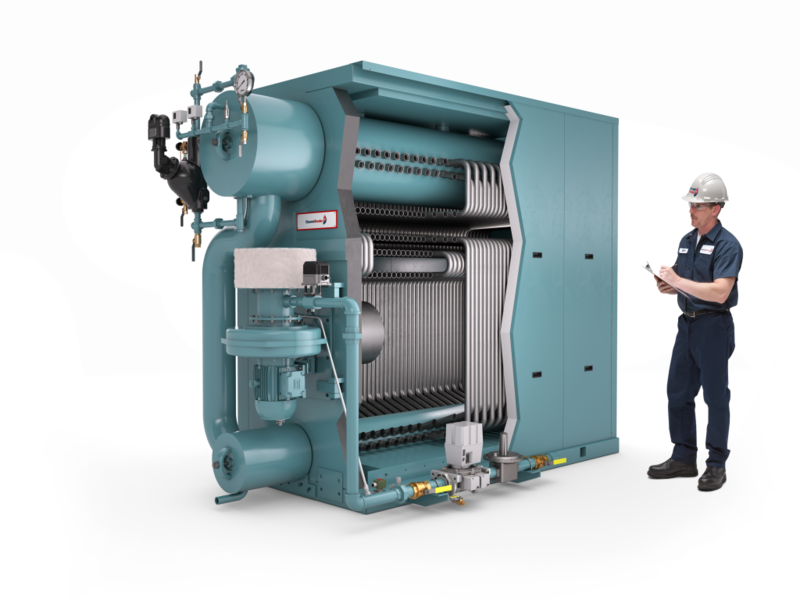 Whether stand-alone, or utilizing a condensing/non-condensing hybrid multi-unit solution the model FLX boilers can share the load to increase efficiency in a hydronic or steam process. The FLX is designed to handle to minimize thermal stress and provide quick response in a compact unit – field erectable units are also an option. With no requirement for FGR piping from the stack to burner, it’s easy to incorporate the FLX into a new or existing boiler system. For rapid response for low or high-temperature pressure heating, back up fuel oil and field erectable. Applications include heating for universities, medical facilities, office complexes and process applications such as manufacturing, food processing and pharmaceuticals. 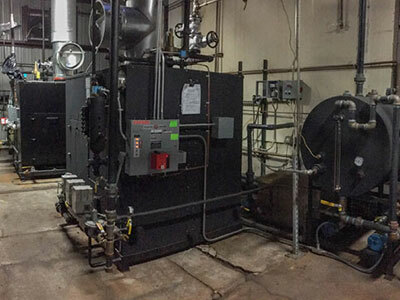 From the Steam-Ready line to custom watertube boilers to OSSG boiler and more, Cleaver-Brooks has extensive experience with large steam boilers – no job is too large. Every aspect of these industrial watertube systems are designed for maximum efficiency, reliability, low emissions and available shop assembled. Central steam plant and industrial process loads. Typical in hospitals, power and utilities and refineries. HRSGs are state-of-the-art customized, packed heat-recovery steam generators with gas turbines from 1MW to 95 MW. Applications include heat recovery for turbines, waste heat, incinerators, economizers and air heaters. These custom solutions are engineered from a single-source to ensure the highest quality output in the 1-15 MW turbine market. Central steam plant, industrial process loads and building heat. Typical in hospitals, power and utilities, and refineries. As the founder of the packaged boiler, Cleaver-Brooks knows all about the power of integration. Today, the rules still apply. 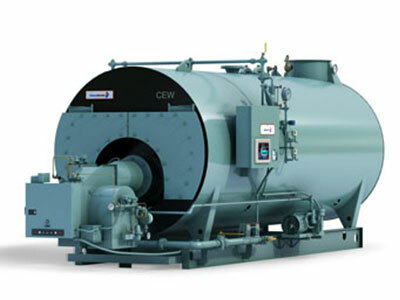 Cleaver-Brooks engineers the firetube boiler along with the burner, controls and ancillary components as an integrated package to achieve maximum efficiency and the lowest possible emissions. The EX models are designed with extended heat transfer tubes that result in even higher efficiencies, lowest emissions and a 15% smaller footprint. The CBEX Elite model is the only boiler package to maintain 3% oxygen across the full operating range with 30 ppm NOx performance when using natural gas. For reliable response for low/high-temperature pressure heating, multiple fuel firing. Applications include heating for universities, medical facilities, office complexes and process applications such as manufacturing, food processing and pharmaceuticals. 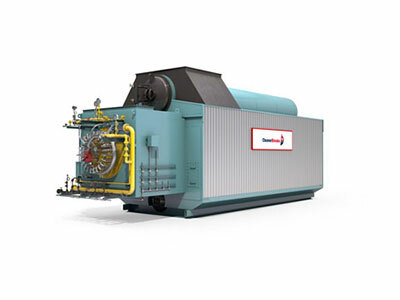 Cleaver-Brooks offers a full line of U.L, and/or CSA Listed high efficiency condensing boilers. 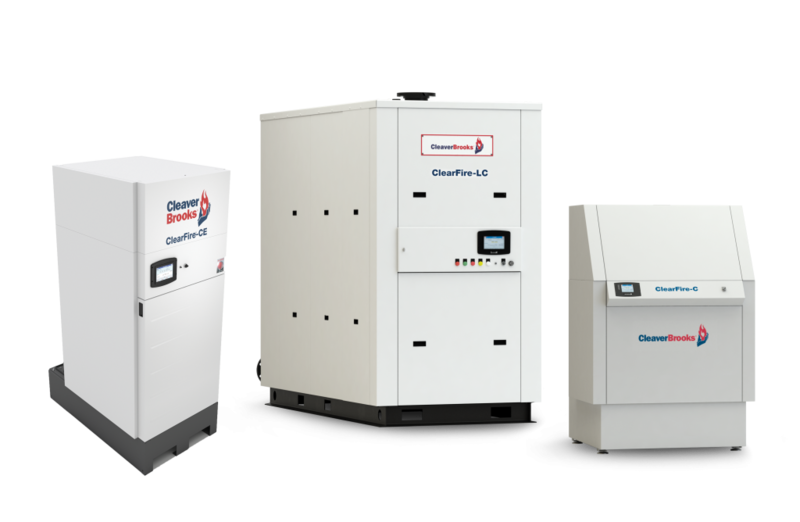 From the ClearFire-C, a compact, vertical down-fired stainless steel fully condensing boiler to the ClearFire-CE, a fully condensing high-mass firetube boiler to the ClearFire-LC, a large capacity boiler that fits through a standard door, we have a size and configuration for your application. 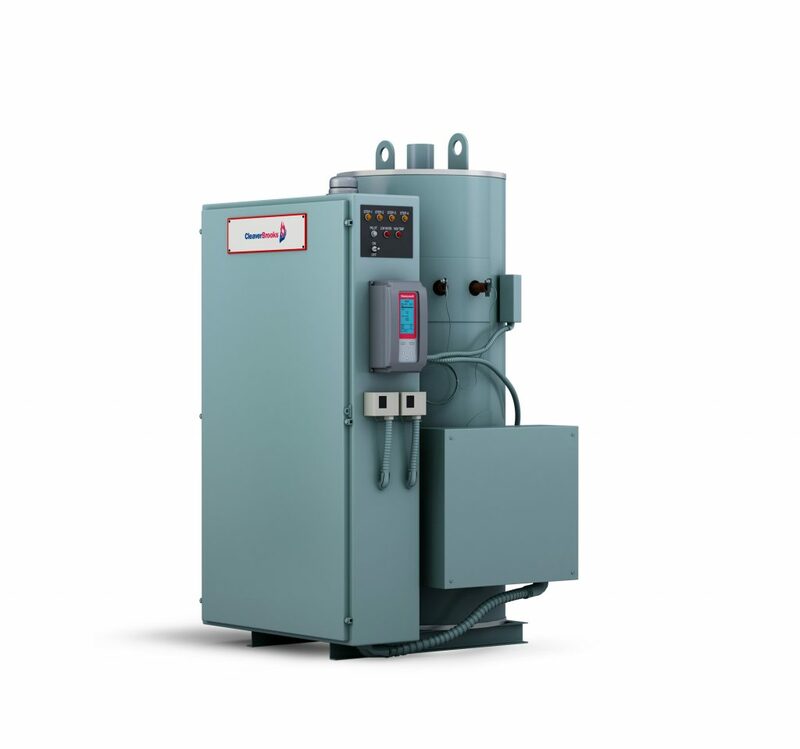 The Parker TC Series is a highly efficient stainless and carbon steel condensing boiler packaged with conventional boiler control and optional low NOx Riello gas power burner for NOx levels to less than 9 ppm. 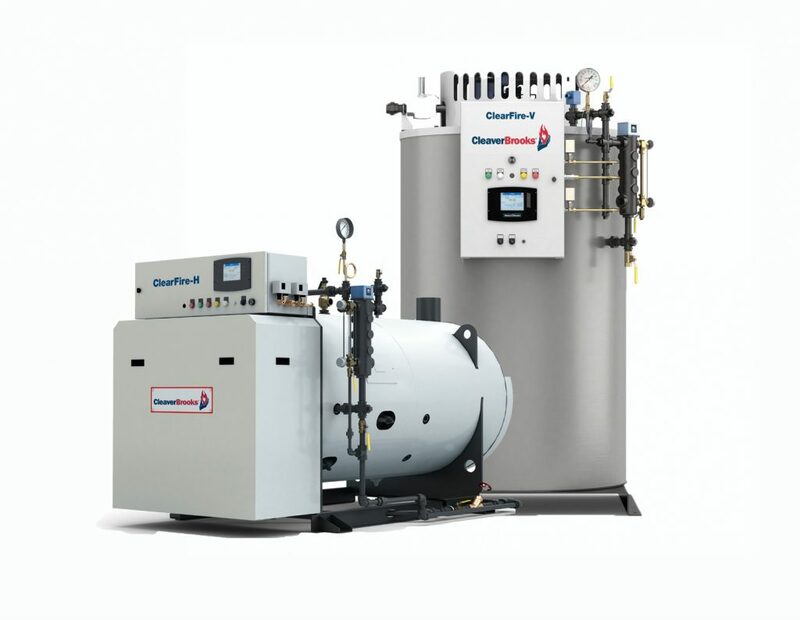 Whether stand-alone or utilizing a condensing/non-condensing hybrid multi-unit solution, the model FLX boilers can share the load to increase efficiency in a hydronic or steam process. The FLX is designed to handle to minimize thermal stress and provide quick response in a compact unit – field erectable units are also an option. With no requirement for FGR piping from the stack to burner, it’s easy to incorporate the FLX into a new or existing boiler system. 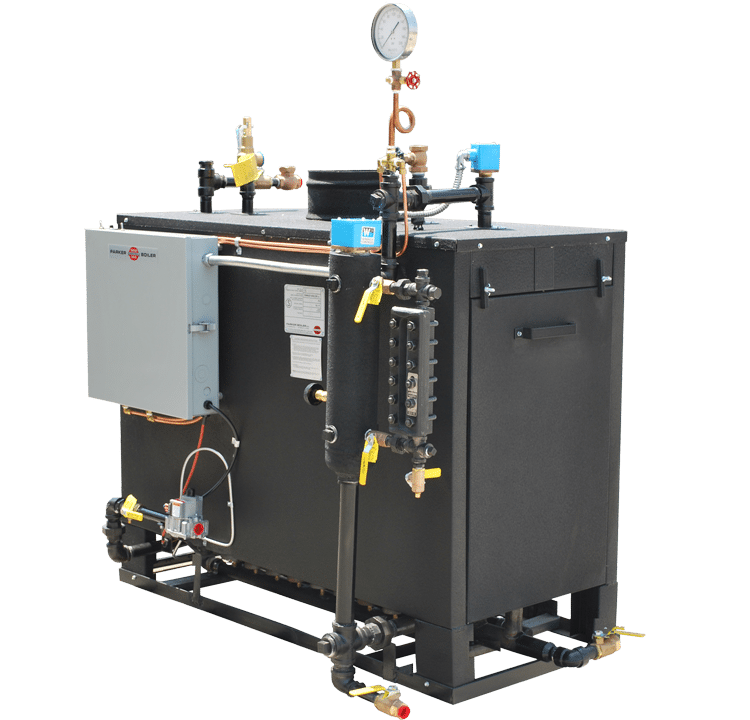 Pre-engineered for steam or hot water applications, Cleaver-Brooks skid-mounted boiler packages come pre-piped with electrical connections for simple and easy field installation. Various boiler designs are available in standard packages or create a custom package with the number of boilers, pumps and accessories. This modular solution is ideal for office buildings, medical buildings, schools, industrial process, heating and process applications. 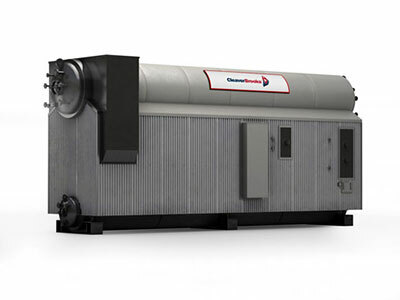 For commercial and industrial applications, Cleaver-Brooks steam and hydronic electric boilers are clean, compact, quiet, easy to install and have no venting or fuel requirements. With no combustion considerations, electric boilers are a good alternative where emissions regulations are a concern. The units typically include operating controls, elements, fuses, contactors, safety valve and instrumentation. Uses: Process steam models are ideal for high and low pressure steam applications like garment pressing, medical sterilizers, steam rooms, air humidification and more.